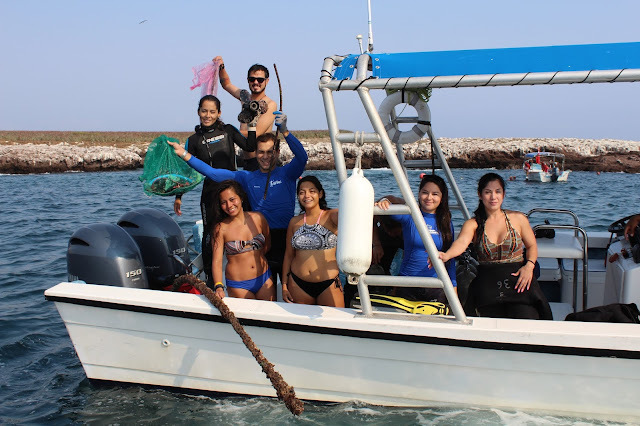 14 scuba divers from different entities collaborated to go deep in five different areas of the two islands that make up the National Park to pick up anything that was not a part of the ecosystem; the Riviera Nayarit BCN turns three on Saturday, June 10, 2017. A cleanup of the seabed took place at the Isla Marietas National Park on Thursday, June 8, 2017 in honor of World Oceans Day. The different entities that participated in the activity were: the National Commission for Protected Natural Areas (Conanp, by its acronym in Spanish), the Riviera Nayarit Convention and Visitors Bureau (CVB), the Centro Universitario de la Costa, Vallarta Adventures, Mismaloya Adventures and Sayulita Entourage. The Navy was also present to guarantee their safety. Fourteen scuba divers took action, going below the waves to depths of between five and nine meters along five different areas of Isla Larga and Isla Redonda in order to extricate foreign objects from the place. The trash that was brought up will be donated to the Humpback Whale sculpture that’s being made out of recycled material in San Pancho. At the end of the day not much was found, which is a testament to the continued application of the norms put in place for visits to the area and to the continual cleanup activities. The investigators from the CUC assured the coral continues to restore itself naturally at a normal pace. Regarding tourism activity in the area, the organization, tranquility, the respect of the visitor limits and boat times, the scheduling and the daily and hourly programming of the different service providers is very much in evidence. The commitment is there and the actions back it up. The different groups that are currently operating in the coastal towns of the Riviera Nayarit will do their part for the Beach Cleanup Network on Saturday, June 10, which marks the third year of this program in the destination.